Four Ohio State Buckeye football players have been suspended for the season opener versus Virginia Tech for violating the Ohio State athletic department policy. Those four players are defensive end Joey Bosa, wide receiver Corey Smith, wide receiver Dontre Wilson and wide receiver Jalin Marshall. It is unknown what the violation is. This is a tough break for the Buckeyes as they’re heading into the 2015 season preparing to defend their national championship. The four players were all major contributors to the Buckeyes winning the national championship. 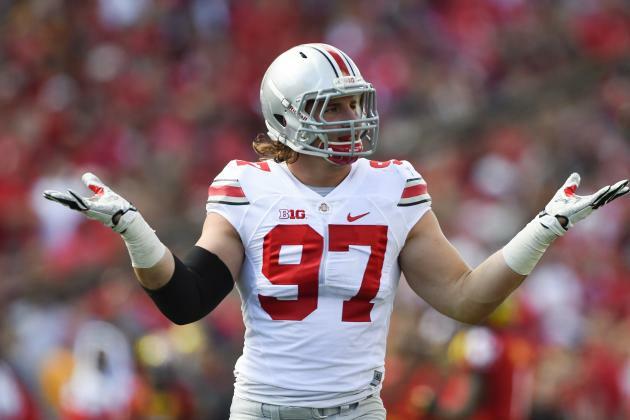 Bosa was the leader of the Buckeye defense with 21 tackles for a loss and 13.5 sacks, part of which has many draft experts tabbing Bosa as the number one prospect in the 2016 NFL Draft class. Marshall had 63 touches for 644 yards and seven touchdowns in an “H-Back” role. Smith had only 255 yards receiving but made but made some big catches in the Buckeyes three biggest games against Wisconsin, Alabama and Oregon. Wilson is the Buckeyes version of Percy Harvin and he had a monster 2014 season although it was plagued by injury. He racked up 1,064 all purpose yards whether it was rushing, receiving or returning kicks. It’s only one game so it won’t be too bad for the Buckeyes. They have multiple weapons on offense including Braxton Miller who is transitioning from quarterback to the H-Back position. The only concern is who’s going to be able top step up for the Virginia Tech game on defense to fill the void of not having Bosa. We have guys like Adolphus Washington and Darron Lee in the front seven but can they make the big impact Bosa makes every game. We’ll find out come September 7.